Washington now has compliant compradores in power in Argentina and Brazil—and perhaps soon in Venezuela. Dilma Rousseff, Brazil’s recently deposed president, calls it a coup. Many, perhaps most, of the countries in the Organization of American States call it is a coup. Even the men who helped carry out the coup admit, in a secretly recorded conversation, that what they were doing was effectively a coup, staged to provide them immunity from a corruption investigation. But the United States doesn’t think that the blatantly naked power grab that just took place in Brazil—which ended the Workers’ Party’s 13-year control of the presidency, installed an all-white, all-male cabinet, diluted the definition of slavery, lest it tarnish the image of Brazil’s plantation sector (which relies on coerced, unfree labor), and began a draconian austerity program—is a coup. It’s democracy at work, according to various Obama officials. 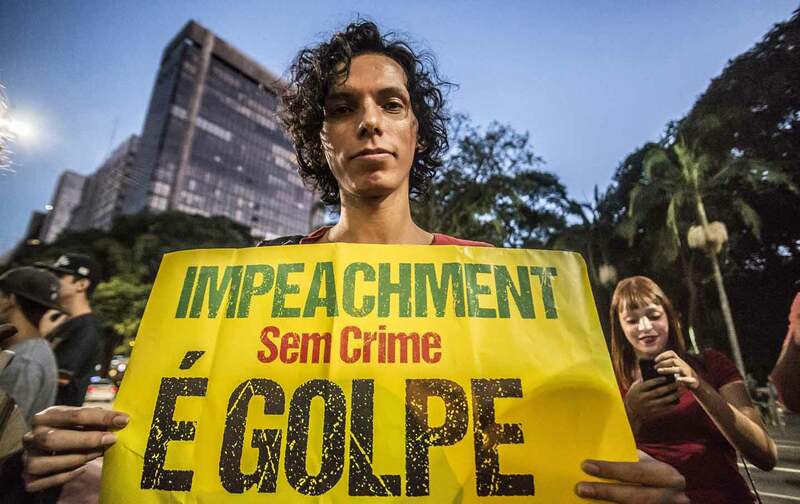 Brazil’s is the third Latin American coup on Obama’s watch. Obama’s predecessor, George W. Bush, heavy-handedly provoked South American governments on any number of issues, including a rush to endorse the 2002 coup attempt in Venezuela, which only worked to steel resistance and build solidarity. The Obama administration, in contrast, has played a skillful long game. His rapprochement with Cuba—ironically, one of the Latin American left’s longstanding demands—has positioned the United States well, as the left as an electoral force is rolled back. Brazil’s is the third Latin American coup on Obama’s watch. All three were “constitutional coups,” using the fig leaf of legality to oust presidents who ran policies slightly ajar to the interests of local and international elites. Honduras in 2009 and Paraguay in 2012 were low-hanging fruit, small countries with outsized oligarchies, where mild reformers were easily dispatched. But Washington’s reaction to those two coups set the pattern for its response now to Brazil: Watch, wait, and quietly encourage the coup plotters, giving them time to consolidate a new order until recognition seems a reasonable course. In Honduras, in particular, Hillary Clinton as Obama’s secretary of state was instrumental in legitimizing the coup’s subsequent death-squad regime. Brazil is the prize: Latin America’s largest, most diverse economy, which, for last 13 or so years under Workers’ Party (PT, in Portuguese) leadership had served as a counterweight to US hegemony. During the high-water mark of the Latin American left’s influence, in the last years of the Bush administration and the early moments of Obama’s, it seemed that Latin America might be the place where the radical Enlightenment would make its stand against the forces of militarism and neoliberalism. Brazil, working together with Argentina and Venezuela and allied with other, smaller nations, scored some remarkable victories: They derailed the Free Trade Area of the Americas, which was meant to be the capstone of the so-called “Washington Consensus” ; they dissented from Washington’s wars in the Middle East and the larger “War on Terror” ; they refused to participate in the Bush administration’s global rendition program; and they pushed back on surveillance. Without US input, the countries of South America joined forces in 2008 to shut down a coup attempt in Bolivia and prevented a war between Ecuador and Colombia. There is little doubt that the US foreign-policy establishment wanted Brazil’s PT out of power. Millions upon millions were lifted out of poverty and brought into the political process. Now, with remarkable swiftness, it all seems to be falling apart. Gains that were thought to have been consolidated have vanished in the blink of an eye. In Brazil, the coup government is promising to cut the Workers’ Party’s signature Bolsa Família, a cash-transfer program that has lifted millions out of destitution, along with other social welfare programs. Argentina’s new right-wing president, Mauricio Macri, has issued a number of “emergency decrees” (which, unlike Venezuela, prompted no outrage from the State Department or the editorial pages of The New York Times or The Washington Post) to impose neoliberal shock therapy. Macri has once again subordinated the economy to bond traders and vulture funders and, reportedly, given the United States permission to establish a military base in southern Argentina, which, if it goes through, would give the Pentagon a much-desired and long-denied toehold in the Southern Cone. What’s left of the left are a collection of smaller national projects—in Uruguay, Bolivia, and Ecuador—that will become increasingly jeopardized as the right consolidates in Brazil and Argentina. The shifting political landscape has opened the door for a new generation of leaders to chart a different course for Latin America. That offers the United States an opportunity to jump-start its relationship with several neighbors…. The United States can help its neighbors become more competitive and stable by promoting investment in technology, innovation and high-quality education. It can point to the security turnaround of Colombia, which has one of the growing economies in the region, as evidence of the potential of sustained security partnerships. Washington can do more to help Central American and Caribbean nations find sustainable sources of energy, now that they can no longer count on subsidized oil from Venezuela. It also can support anticorruption initiatives that citizens around the hemisphere are clamoring for. Still trying to sell neoliberal unicorns. Nothing of the sort is going to happen, now that the United States has compliant compradores in power in Argentina and Brazil, and perhaps soon in Venezuela. The United States isn’t going to “help its neighbors become more competitive and stable by promoting investment in technology, innovation and high-quality education.” Over the past 13 years, Brazil, more than any other country, has stood in the way of Washington-backed efforts to impose a punishing intellectual and corporate property-rights regime on Latin America. That, in effect, is one of the objectives of the Trans-Pacific Partnership trade treaty, which was offered as a successor to the failed FTAA and meant to work around Brazil, Argentina, and Venezuela. But now that friendly faces are installed in Brasília and Buenos Aires, the path is clearer. Monsanto and other agri-behemoths will be able to impose their seed monopoly on the regime (as the United States now does in Central America, to devastating effect); energy resources will once again be privatized (as Hillary, as secretary of state, pushed to do in Mexico). If you want a more realistic view of what Washington might accomplish now that the “left” is “on the run” in Latin America, look beyond the Times opinion pages to its reporting, where just yesterday it was revealed that US military aid had turned the Mexican army into the most unaccountable killing machine operating in the Western Hemisphere. Look to Argentina in 2001–02, where strict adherence to the Washington Consensus led to one of the worst economic crises in recorded history. Look to El Salvador today, where the Obama administration is using the terms of a free-trade agreement to force the government to shut down a local seed-distribution project, since it violates corporate interests. Look to Ecuador, where Chevron has turned a good stretch of the Amazon into a toxic tar pit. Or Paraguay, which after its 2012 coup was taken over by an agro-gangster government. Or look to the US-Mexican border, where refugees from US “security partnership” risk death in the desert for the privilege of living their lives in the shadows.